In the name of her daughter, Leonore, Princess Madeleine of Sweden celebrated her nephew, Princess Estelle's 4th birthday on Facebook and shared a photo showing cousins during the banns service of marriage for Prince Carl Philip and Sofia Hellqvist at the royal chapel. 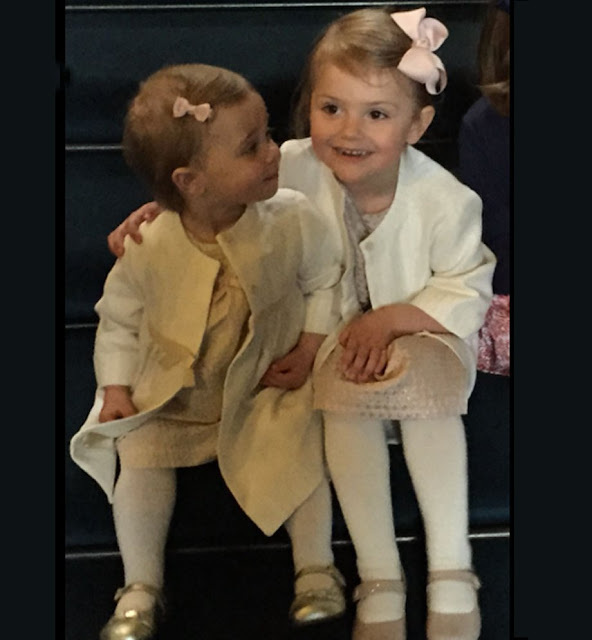 Princess Leonore wrote in her celebration message "Cousin - I will always love you my friend. Happy birthday to you dear Estelle! your cousin Leonore." This picture is so sweet. :) Estelle will be a great sister I think. No, that's not from the wedding seremony, but in any case, they are adorable. Richtig. Das Foto ist nicht auf der Hochzeit, sondern zum Lysningsgudstjänst aufgenommen worden. Adorable photo ! Estelle with the protective arm around Leonore, and Leonore looking lovingly at Estelle ! Beautiful ! Dear little feminine Estelle - why would you call her Princess Madeleine's NEPHEW? She is of course her niece! Süüüüüüss, einfach niedlich die girlies.